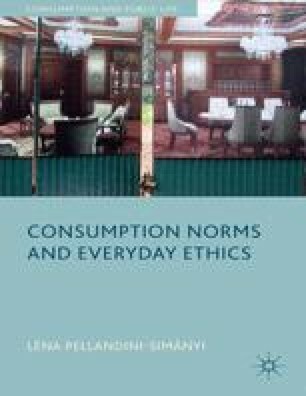 The previous chapters argued that consumption norms are based on cosmologies, involving pragmatic beliefs, as well as normative ideas of good life and justice. Throughout these chapters I have treated consumption norms as abstract ideas. This simplification was necessary to elaborate the questions of what consumption norms are about and where they come from, but does not provide an adequate model of how consumption norms actually work in everyday life. In reality, most consumption norms refer to and operate in practice, and hardly ever get articulated, let alone in abstract terms. This chapter corrects this simplification by taking a closer look at how consumption norms operate, in particular at the connection between normative ideas and consumption practices. Its central point, explained in the first part of the chapter, is that normative ideas are often so inseparable from practices that the very term ‘ideas’ becomes questionable. Ethics in these cases primarily exist in practice; that is, norms denote specific practices of right behavior, rather than abstract principles. To capture this emphasis I introduce the notion of practical ethics. The concept indicates that normative visions of how to live and whom to be are embodied and objectified in practices; and consequently are experienced, transmitted and negotiated principally through material culture practices rather than through abstract concepts.